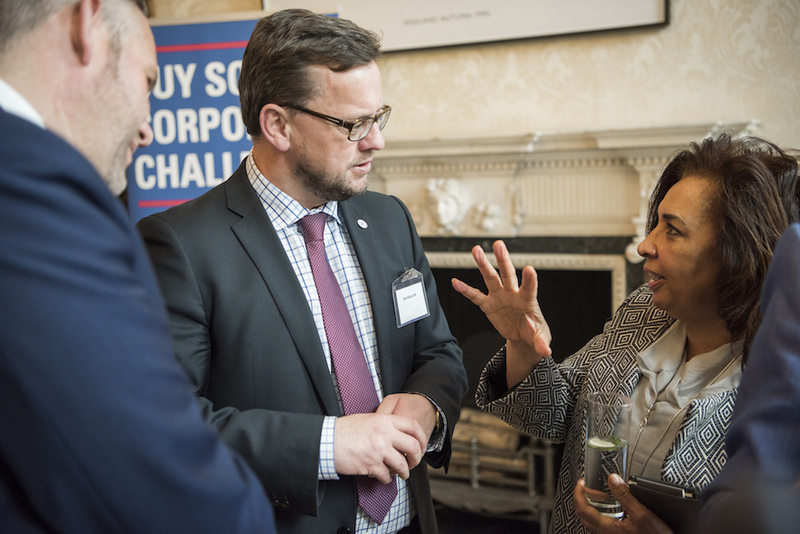 Businesses including Johnson & Johnson and PwC are aiming to spend £1bn with social enterprises by 2020 as part of the Buy Social Corporate Challenge, which launched at Number 11, Downing Street this week. Deputy CEO of Social Enterprise UK (SEUK) Nick Temple explains all. Our work has been inspired by the Billion Dollar Roundtable in the US, and the levels of associated ambition. Achieving the collective target won't be easy, but should drive different behaviours on the way – these will be required if we are to achieve what we have all set out. We are being deliberately ambitious. The founding (magnificent) seven have significant spend and supply chains, but we hope they will be joined by others from across a range of industries and sectors. The power is in the collective, and the more that join, the more powerful it will be. We can also then support them as peers to share experience, overcome challenges and develop common frameworks. To achieve these kind of spend levels, we will need what I've described to colleagues as a 'full court press'. For those who don't like basketball, it basically means throwing everything at something and involving everyone in a collective effort. We will need small discretionary spend with social enterprises and we will equally need significant strategic deals with social enterprises. And everything in between. In mapping the supply chains of several companies (rather than one or two individually), we anticipate being able to identify market opportunities for social enterprises: new areas where existing social enterprises might diversify to meet demand, or where new social enterprises might be established. Social investors may have a role here too. We have got better at brokerage, and we are investing in improving the Buy Social Directory but there is more to do. We anticipate being heavily directly involved to start with, but social enterprises joining as members or to the directory helps us build up the fullest possible database. And create opportunities for as many social enterprises as possible. Obviously the focus of this initiative is on spending to increase social impact. But working with such large companies also has opportunities in increasing awareness of social enterprise – if they have a million employees between them, that's a million potential people to hear about this initiative and about social enterprise. Clearly, a spend target is not the ultimate aim: we are encouraging more spending with social enterprises because we believe they help create more social value as a result: through changing people's lives, regenerating communities and improving the environment. Working with the companies, we will seek to do some joint work on the changecreated by the collective spend: all those involved are focused on this. It is common these days for someone to say that something is a 'journey', and this is no different. Of course, 'journey' is often just code for 'it's going to take a lot longer than you think and be a lot harder than you imagined'. So we are under no illusions on the work of the next five years: after all, it's taken us four years to get to this point, working with pioneers like Wates and Johnson & Johnson. This is a milestone and something to be recognised, but it's only a platform to achieve more – the work very much starts here. "The open wound on responsible business is around tax"
CEO of Business in the Community Stephen Howard can boast a decade of experience of encouraging companies to do the right thing. We talked to him to find out what changes in attitudes he has seen during that time.